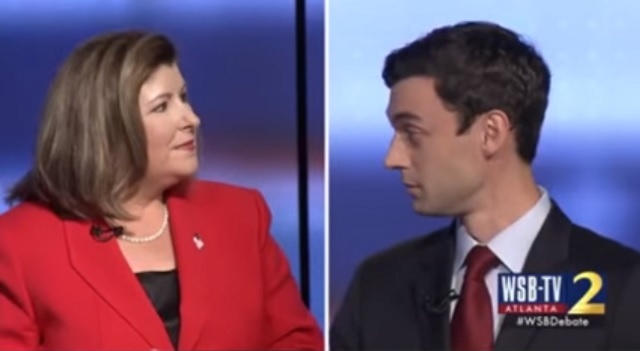 Democratic congressional candidate Jon Ossoff, who is running to represent Georgia's 6th Congressional District despite not living there, froze up during a debate on Tuesday with Republican candidate Karen Handel on Tuesday after being asked who he was going to vote for. Ossoff is unable to vote for himself because he lives outside of the district. "So Jon, I guess what I would like to know is who exactly are you going to vote for in this election?" Handel asked. Ossoff froze up and looked down at his notes for several seconds before soullessly reciting boring, over-rehearsed talking points. Even Democrats criticized Ossoff's weird, robotic behavior after he failed to win the election in round one. He makes Hillary Clinton seem personable. Almost all of Ossoff's funding is from out of state. It's rather remarkable the establishment has been able to prop this empty suit up, even with millions of dollars and endless positive press coverage. As Handel noted, he refused to debate her on CNN, probably because he fears "The Hillary Clinton Effect," whereby the more people see your soulless personality, the less people want to vote for you.